Elaine is a delight to work with and extremely accommodating. The property has all the comforts of home along with spectacular views. I found Marilyn, and her staff Elaine and Annette, to be friendly, prompt, and helpful. Steve was excellent as well. My husband and I very much enjoyed our 2 month stay at Casita del Pajarito. Even though compact, the space and layout make sense, and worked well for us. The unit is tasteful and beautifully furnished, and has a good amount of natural light. The kiva fireplace was fantastic, especially having firewood delivered through Adobe. Closet space is ample, bed linens and towels are high quality, and the kitchen is well stocked. The king bed was very comfortable and the shower is large with great water pressure. In addition to the overall comfort of the Casita, it was very quiet, well located, and always felt to be a safe and wonderful refuge. Our experience with Adobe Destinations was excellent, and we would definitely recommend them, as we found them to be professional and responsive. The helpfulness, friendliness and responsiveness was top notch. It made the entire experience an excellent one. The property itself was beautiful and had everything I ever needed. It was well maintained and when, maintenance was needed, the response was immediate. The location was perfect, quiet, but close enough to the center of town to walk. The neighbors were very friendly and always helpful. As I said above, the property was just beautiful, the responsiveness of the management team excellent and the location perfect. I was very happy while there and would certainly consider returning were events to allow it. Elaine was very helpful and responsive. This is a beautiful property with magnificent vistas. Emails were answered promptly and in friendly tone. Requests for change to price and one of contract requirements was accommodated. Package deliveries ahead of our arrival were handled efficiently. High marks to Adobe Destinations. La Fantasita was one of our top vacation rental experiences. Its tastefully attractive interior and patio, airy high ceilings, convenient walk-to-Plaza location, and the owners' extensive collection of kitchen gear and local-interest books... made for a lovely one-month stay. We'd happily return. Beautifully appointed adobe with every amenity needed. Easy walk to Plaza, Canyon Road and Farmer's Market. Great privacy with the 2 enclosed court yards. This place feeds my soul. La Fantasita is an all around gem. The location of this property is ideal to enjoy all Santa Fe has to offer - the plaza, restaurants, shopping as well as the beauty of a quiet neighborhood. The house itself is wonderful as well. From the patio for enjoying morning coffee to the beautiful decor inside and out. It was clean, very comfortable, and well stocked with all we needed. We thoroughly enjoyed our stay and will definitely return. 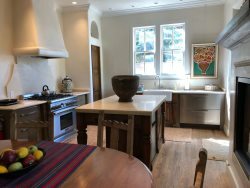 This property was the perfect place for my friends and I to enjoy Santa Fe. The photographs and description on the web site are terrific, but they don't do Suite 16 justice. It exceeded our expectations. It is beautifully decorated, well equpiped, private, and incredibly comfortable retreat. it was so comfortable and beautiful that I didn't want to leave. Elaine got me through everything with ease. She got me excited about ZoZo and the awaiting green chile cheeseburger!!! Nom Nom Nom! Thank you Elaine! The house was incredible! All the notes really helped out. Clean, stocked beyond needs. Beds were way comfy, Slept well every night. Showers roomy and nice. I'm a big guy so that means a lot to me. So close to everything. Reading material a bonus. Just a fantastic house... Loved the dcor! A definite repeater for us. The team was very friendly and wanted to please. My sister and I come out once a year...this property is our fav. We love sitting outside and cooking outside...this property filled the bill by having a privacy wall around the patio and a grill. The beds were sooo good because I actually slept all night. The master bedroom,bath,walk in closet/utility. But I have to say the beautiful flower beds and flowers growing on the wall and courtyard makes the entry very inviting. Everyone....tops! Clean, well-stocked, comfortable - a real treasure. We've used you three times and each time has gotten better. very comfortable and a great location. We enjoyed the clever decor. Everyone was great and so friendly. Jewel of Circle Drive is a wonderful property with everything you could ask for. And is pet friendly!